I’ll never know why a classic dressing vanishes from the food scene, but Green Goddess Dressing is an all time favorite of mine for a simple classic retro salad. I made a big container of dressing and when I saw this week’s challenge, I thought well why not just add an avocado and a little buttermilk to the already mixed dressing from The Essential NYT cookbook, Ellie Krieger’s recipe calls for buttermilk and avocado for the creamy aspect of the dressing. I had already blended mayo and my other ingredients so I didn’t see any harm in combining so as not to waste the last of the dressing. For the second night I dressed small Campari tomatoes for a simple tomato and lettuce salad to go with the roasted clams for dinner. 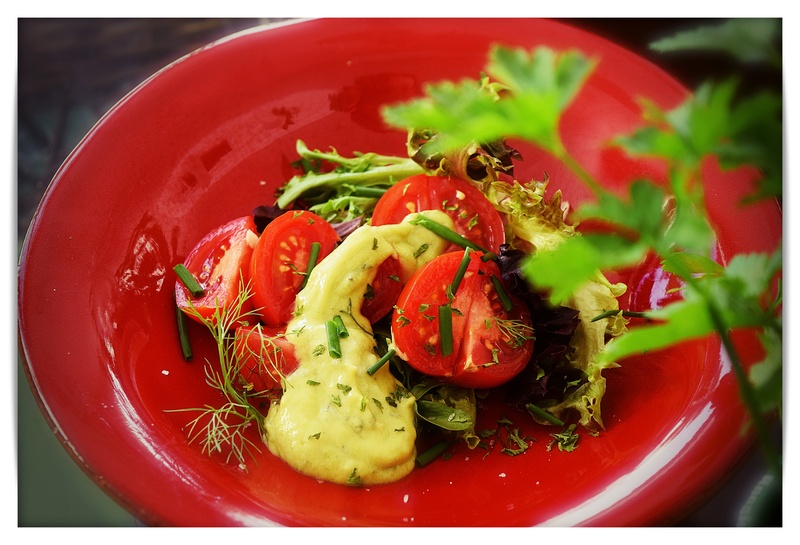 Simple green additions to green goddess dressing include basil, tarragon and parsley…I love the addition of anchovies, the poor misunderstood little fishes, so much flavor and they vanish in many dishes. So the NYT version is listed first then you can compare to Ellie’s version and perhaps do what I did, combine the two. Of course lettuce choices vary, but for our steak, potato and salad dinner a wonderful artisan romaine was my choice. Again drizzle the dressing around the inside edge of the bowl and gently toss to lightly coat the leaves. 1. Place the garlic in a salad bowl, and whisk in the mayonnaise, vinegar, Worcestershire sauce, chives, anchovies, and anchovy oil. Add cracked pepper to taste. Let stand at room temperature for an hour or longer. 2. Just before serving, add the parsley and break the romaine leaves into the bowl. Toss until the dressing is well-distributed. Ellie’s Green Goddess Dressing blends well with the dressing above. Place all of the ingredients into a blender and blend until smooth. Any leftover dressing will keep well in the refrigerator for 2 to 3 days in an airtight container.